Hi! 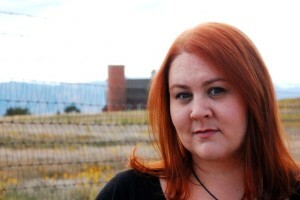 I’m Meredith Moore, the author of I AM HER REVENGE and FIONA. I love lattes, unwieldy stacks of books, and the Scottish Highlands. I write dark and twisty books about secrets and gaslighting and first love. I’m constantly trying to decide if I should get a dog or not. DIRECTIONS: Below, I’ve included my favorite number. 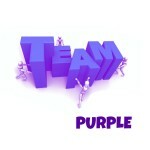 Collect the favorite numbers of all the authors on TEAM PURPLE and then add them up. HINT: The secret number is highlighted in PURPLE. On this hunt, you not only get access to exclusive content from each participating YA author, you also get a secret number. 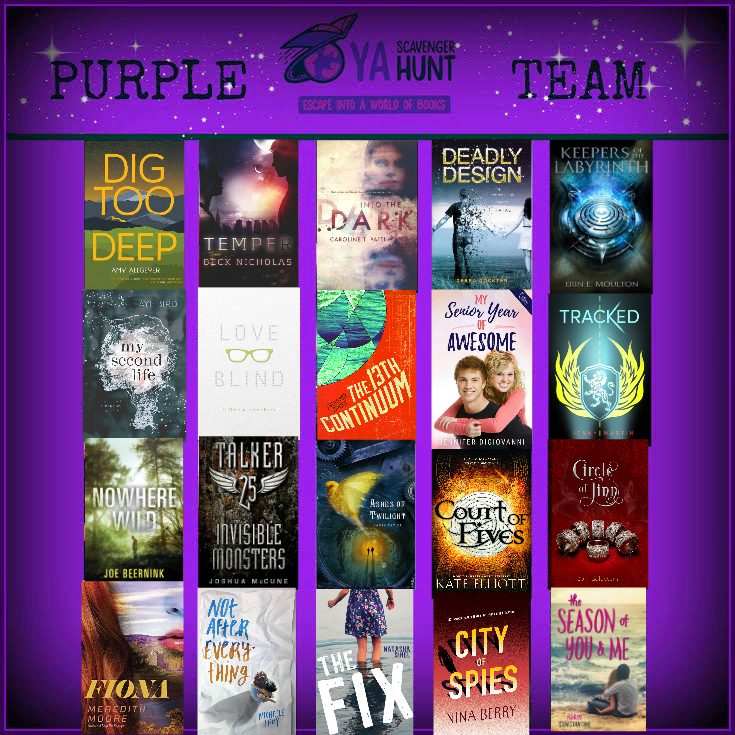 Add up the numbers, and enter it for a chance to win a major prize–one lucky winner will receive at least one book from each author on my team in the hunt! But play fast. This contest (and all the exclusive bonus material) will only be online until noon PST on Sunday, April 3rd! There are NINE contests going on simultaneously, and you can enter one or all! I am a part of the PURPLE TEAM, but there is also a Red Team, Blue Team, Gold Team, Green Team, Orange Team, Teal Team, Silver Team, and Pink Team. Check out each team for a chance to win nine different sets of signed books! And now for the author I’m hosting on this hunt! 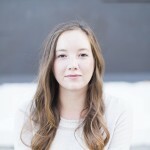 BIO: Michelle Levy hails from Denver, Colorado and now lives in Los Angeles, California, where she works as a casting director for film and television, casting for such projects as Six Feet Under, Deadwood, Bruce Almighty, and more. Not After Everything is her debut novel. Visit Michelle online at michellelevybooks.com, on twitter: @m_levy, on Facebook: michellelevybooks, and on Instagram: @michellelevy. Random fact from Meredith: Deadwood is one of my top 7 favorite TV shows. Fans of Eleanor and Park, The Spectacular Now, Willow, and Perfectly Good White Boy won’t be able to put down this gritty but hopeful love story about two struggling teens. This tough, realistic page-turner reveals a boy’s point of view on loss and love—perfect for fans of Rainbow Rowell, Tim Tharp, Julia Hoban, Carrie Mesrobian, and Mindi Scott. And now for the Secret Bonus Material! Michelle’s given us a super hot deleted scene. Enjoy! She sets her water bottle on the small table and takes mine out of my hands setting it next to hers. She’s smiling at me in that way that makes me practically lose my footing. I desperately need to undo the top button of my shirt or I might pass out. She takes my hands and moves them away from my neck, and she slowly unbuttons the top button for me while staring deep into my eyes. Then she moves to the next. And the next. Never losing eye contact. It’s so hot. Once the whole shirt is unbuttoned she brushes her hands up my bare chest and pushes the shirt off my shoulders. She kisses my neck, then my shoulder, then my chest, then my stomach. Her lips are so soft and hot where they brush my skin. I can feel them on my skin long after they’ve already moved on to the next spot. She kisses her way back up my chest while her hands unfasten my belt. When my pants hit the floor, I take her hands and place them at her sides. I slowly slide my hands up her arms skimming her skin with the tips of my fingers. One hand comes to rest behind her neck and with the other I brush my thumb across her lips. Her eyes flutter shut. I lean in and kiss her just next to her mouth. Then I brush my lips right beneath her ear. She melts into me as I kiss her neck. The jasmine scent of her practically makes me drunk. I push her hair out of the way of her zipper. I allow my lips to linger on that spot under her ear that drives her crazy while I slowly unzip her dress. Her breathing picks up, as does mine. I trace my fingertips up her back following the line of the zipper—she’s not wearing a bra and I almost forget to pace myself—and then I pull the straps down over her shoulders and the dress falls to the floor. I slowly kiss every inch of her neck working my way to her mouth. When my lips finally meet hers, my hands drift down her body. She moans against my mouth. It’s such a turn on that I can affect her this way. She curls her hands in my hair and our kissing deepens. I take it all in—the arch of her back, the seductive smoothness of her skin, the taste and urgency of her lips, the cadence of her breathing—savoring every single sensation. I want to screen capture this moment and live in it forever. You can buy NOT AFTER EVERYTHING on Amazon and Barnes & Noble. AND, to win an annotated copy of my book FIONA, enter the Rafflecopter giveaway below! Ready to move on? Head to Robin Constantine’s blog by CLICKING HERE. 92 Responses to Spring 2016 YA Scavenger Hunt! My favorite place in the world is the West Coast! It’s beautiful! My fave place is Disneyland! I love somewhere tropical or green that isn’t overcrowded with people. Thanks for participating in the hunt! My house, I just really like being at home! My favorite place is St. Louis, MO. I have family nearby so we get to visit, but there is so much to do there. Oh, that’d be the beach. But the wild beach, where you get cliffs and big waves and the wind tries to pick you up. Cape Spear is a good example. It’s a toss up between London, Scotland and Ireland. Accents are the best. My favorite place in the world is my desk where I write! i love asia – specifically korea and japan! I’d have o say London! I visited this past summer and fell in love with it! My favorite place in the world (that I’ve been anyways), is Castaway Cay, Disney’s private island in the Bahamas. My favorite place in the world would be Rome because there is a lot of history and greek mythology involved with it. My favorite place in the world is home! Puerto Rico. BEAUTIFUL! My favorite place in the whole world would have to be Disney World! The reason being that the first time I went, it was a December vacation with my husband and daughter. Everything was just so magical; I will never forget the wonderful time that we had. My favorite place in the world is Iceland. My house is my current favorite place. My favorite place in the whole world is sitting at a piano playing my favorite songs. Currently, I guess my favorite place would be Disney World! One of my most favorite places in the world is my home in the winter. When it is snowing outside, sitting in front of the fire with a cup of hot cocoa and a book. The best! Honestly home is my favorite place in the entire world. There’s no place like it. My favorite place is London. I’d give anything to go back! My favorite place in the whole world is Disney! Jalisco!! It’s so beautiful and the Aztec ruins are amazing!! My favorite place is where my family is. Seattle is my happy place! My favorite place is Santa Barbara. We went there every summer when I was a kid and it’s still one of the most beautiful places I’ve ever been. My favorite place is somewhere along a nice, beautiful, and peaceful beach along with lots of rich history. I love to live by the beach and smell the salty ocean air! My favorite place is our home here in the South. I feel so comfortable here with my family. My favorite place in the world is my home! The mountains is my happy place. My favorite place in the world is Toyon bay on Catalina Island. My favorite place in the world is Ireland. Nothing better than walking down the streets exploring each town I stayed in. I haven’t traveled enough to decide on a favourite place! I’m always happy in a bookstore though! The library! Where else? I’m a teen librarian and I love my job so the library is my favorite place! My favourite place (at the moment) is Margaret River in Western Australia. It’s so beautiful there and soo relaxing – the perfect place for getting some reading done! My favorite place in the whole world is Fort Worth, TX. I went to college there, and it’s so achingly familiar to me. I miss it so much! My favorite place in the whole world is my home or wherever my family is! My favorite place would be a bookstore. Anywhere in a book. I love reading and can go anywhere between the pages. Cape Cod is my favorite place in the world!! Some of my favorite books as a kid were set there and I’ve bought so many good books there and my favorite family members live there!! it’s a magical seaside peninsula shaped like a hook and the ice cream is divine. If a place felt like the smell after rain it would be Cape Cod. My fav place – sometimes it’s just at home with my cats and a good book! Other times it’s where ever my friends and I gather! Albufeira, Portugal is my favorite place I’ve ever been. New Zealand. I have never been there, but have read about it, and many shows have been filmed there. It has breath taking landscapes! You’d think it’d be in my bed the number of hours I spend in it reading away. Probably one of our national parks, but don’t make me choose! Just somewhere surrounded by nature with a beautiful landscape to surround me. My favorite place is Hogwarts.. and Harry Potter WOrld IRL.. and also my church, the place/ reasons I grow as a person. Thank you for all the giveaways! My bed is my favourite place along with being in the nature. My favorite place is actually my house. It’s my first home and I love it. Favorite place to travel to however is a tie between Portland, OR and Edinburgh, Scotland. My favorite place is the beach. Home is my favorite place in the world. Home is where my mom is. My favorite place would be the reading nook I’m going to build in the future. Is has a good spot in the window where a tree will shield me from excessive heat or sputtering rain. I hope the house’s in the country. Im gonna be biased and say my home in Massachusetts! My favorite place is my room since it has all my books and is my quiet place. My favorite place is Jax Beach, Florida. Some of my best memories are there. My favorite place to visit is Ireland. My favorite place to be is my house!